Generally, when there is a lineup, it draws attention. Much like a traffic accident on the freeway, everyone needs to take a look. Heck, even a broken-down car at the side of the road draws stares. Call it human nature. 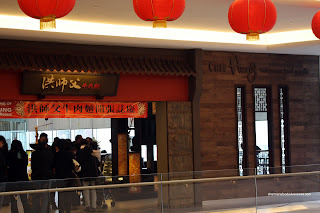 So, when I saw Ben's tweet about the absurd lineup at Chef Hung in Aberdeen Centre, I initially thought to avoid it like a "faux" lineup at a club. Compounded by the fact that many early reports indicated that the food didn't live up to the hype, I was skeptical. Now skepticism is one thing; yet that has never stopped me before. Even though it's in my favourite driving purgatory, I was determined to find out myself. Ma was nice enough to join me even though I had a difficult time explaining that these famous noodles may or may not be good. Luckily for us, we arrived early enough to avoid the lineup. We shared an Onion Pancake Beef Roll to start. 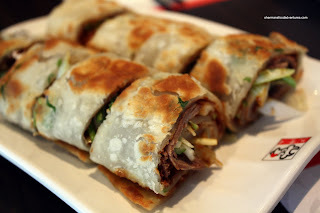 It was served hot with tender sliced beef shank, scallions and julienned cucumber. The pancake was soft and flaky and there was just enough hoisin. This was a good dish. I added a side of marinaded cucumbers and that was also very good. Crunchy, sweet, garlicky and a bit spicy, I could eat a whole bowl of these. 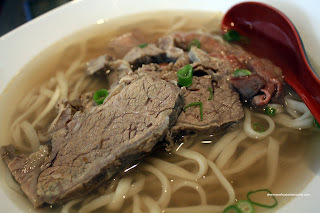 With suggestions coming from moi, she opted for the Beef Brisket Noodle in clear soup. As others have commented, the bowl of noodles looked really plain and tasteless. Upon taking a sip of the broth, it was indeed very light tasting. I could get a sense of beef flavour; but it was "shallow" at the very best. Now, I do realize this was their intention and I'm not going to knock them on it. On the other hand, the noodles were nice and chewy, while the meat soft and tender. Personally, I prefer spicy beef noodles. And that's what I got, the Spicy Shank, Tendon and Tripe Noodles. Now for those who complained that it wasn't spicy enough, I have absolutely no idea what they are talking about. Not that it blew my mind; but the broth was plenty flavourful and spicy. 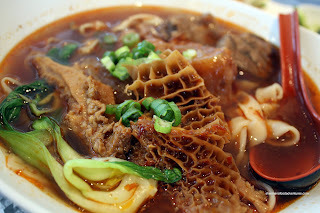 Extremely large pieces of shank and tendon mixed with soft tripe sat atop chewy flat noodles. Despite what others have said, I acutally liked my bowl of beef noodles. Now was it worth $11.00? That's debatable. If this is what you like personally, then it is. If you don't, then not. I know one thing is for sure, I wouldn't lineup for it. - Is it really worth $11.00? - What's with the lineup? Wow. A 28% rating? Even Sui Sha Ya got 44%...with more votes! So much for the hype. Street food should be left to those a little closer to the pavement. I have been here twice and at least the line ups are getting shorter. I know it's an expensive bowl of noodles but a very delicious one at that. I have tried both the plain and the spicy version and I definitely prefer the spicier version. I think it's partly due to the hype (supposedly award winning hand made noodles and the unique way they make their famous #1 bowl of noodles by flaming the beef). The meat is very tender and the noodles just slide down ever so smoothly. It's not a place I would go to on a weekly basis, but I would definitely come here when I feel like treating myself to a premium bowl of noodles. Karl, I think the low rating is probably due to the lofty expectations. I'm sure not everyone who voted hated the noodles. I ate them and they were good. But I think some got turned off by the wait and the price. Holly, I agree. I liked the noodles. However, I just don't think I'd lineup for it. If I was around and there was no lineup, I'd eat it again. Did you feel hurried while you were there? My biggest pet peeve (aside from paying premium price for not so premium noodle dish), is the way they try to rush you to finish your meal and vacate your table. I saw a post in Dinehere that complained about that too. They take your bowl as soon as you literally put down your chop sticks and then give you the bill without asking for it. Hi Jonnek, I didn't feel rushed at all. However, I'm not sure if they saw me taking photos or not. I tried to be as discreet as possible. Either they have improved in that respect or maybe they knew what I was doing. Hard to say. OMG, what a low rating from urbanspoon. Now I am curious.. LOL.. They advertised as an awarding winning restaurant, yet the rating is so horrible. I wonder if there is any line up now. I have gotta go check it out, but really that's some expensive beef noodle. I lunch at Aberdeen Center like 3-4 times a week, and for the last couple of weeks I didn't see lineups even on weekends. Maybe finally people have realized that lining up is not worth it. I was @Aberdeen again @lunch. I hate to see business trying hard but fail not knowing where they go wrong. My interest in foods was enough to put myself through courses @La Varenne & Le Cordon Bleu in Paris and Restaurant Assoc of Singapore. In case Chef Hung TBN is lurking here, just a thought to share. Nearby Guu is charging Udon @7.80 and customer most likely also order sashimi + sushi or bento; thus the bill will be somewhere btw 20 - 30 per pax. Owner of CHTBN may want customers to spend each around 20-30 consisting of TBN @11 + this + that. B-U-T one cannot teach a customer to unlearn his eating habits. Ramen, pasta, TBN, cassoulet, pizza ... are comfort foods. Hard to expect a hungry customer yearning for a hot bowl of TBN, playfully nibbles 2 or 3 other side dishes to satisfy his hunger. What is the pricing @Kintaro Robson that continues to bring in satisfied customers! Seafod Undon @Fisherman's Terrace @15 can feed 2-3 persons with room for more dimsum. But then they are not TBN.